Kitchen Grease Filters | Why Install Disposable Kitchen Grease Filters? WHY INSTALL KITCHEN GREASE FILTERS? Kitchen oil and grease build-up starts in the metal kitchen grease filters before travelling through into the hoods and ducts, all the way to the roof. At best, these regular metal kitchen grease filters only capture between 20-40% of airborne grease, leading to a build-up of kitchen grease that needs to be cleaned off on a regular basis in order to stay compliant and covered by insurance. It’s an ongoing problem that needed an easy and cost-effective solution. It is therefore recommended to install kitchen grease filters from Shepherd Filters for the ultimate protection. Kitchen grease filters from Shepherd Filters are 100% disposable and can capture up to an impressive 98% of grease before it even has the chance to enter the rest of the kitchen exhaust system. Many commercial kitchens do their grease filter and/or kitchen hood cleaning nightly, weekly, monthly etc., amounting to large labour costs. Repairs & maintenance call-out fees are often high due to the large amount of grease that can build up in the hood, ducts and rooftops, etc. Water rates can also be exorbitant due to constant kitchen filter cleaning. Chemical cleaners are not only expensive but can be toxic to humans. When flushed down the drain, these chemicals can also seriously impact the environment. Kitchen hood exhaust systems continue to feature prominently in commercial building fire events. Fire statistics from Australia, the UK and the US show that fires in restaurants predominantly occur in kitchens. The ignition of cooking materials make up almost half of commercial kitchen fires and 90 percent get into the kitchen exhaust system. Grease, dust and oil from cooking activities will build up in kitchen exhaust system if it is not regularly maintained with thorough kitchen exhaust cleaning, creating odour problems as well as a fire risk. It only takes 1/12 inches or 2 mm of grease build-up to burn down a kitchen exhaust system. A grease fire can burn through a typical fast food style restaurant in as little as 5 minutes. When kitchen grease filters are full of grease, it is transferred to the kitchen hood and released into the gutter for cleaning out. When too much grease is in the kitchen hood, it can travel up the duct and spill out creating an environment issue and fire risk. Many restaurants never re-open after suffering a fire loss and insurance policies may exclude claims related to uncleaned or grease-laden exhaust ducts. When a restaurant is located in a larger building or complex, such as a Hotel, Hospital or Shopping Centre, Airport or Multi-storey complex the risk increases exponentially. A fire in a kitchen exhaust system in Heathrow Airport shut down three terminals, delayed or canceled hundreds of flights and generated hundreds of millions of dollars in losses that far exceeded the physical damage bill. That fire spread through 200m of exhaust duct-work to a plant room before it was extinguished. Switching to Shepherd Filters on the face of kitchen grease filters will mitigate these issues. Commercial kitchen fires are an all too common occurrence in Australia. In 2014 alone, just five restaurant fires caused $30 million of damage – among them St Kilda’s iconic Stokehouse. Sean McGowan reports on the release of a new AIRAH technical bulletin that highlights the fire risks inherent in commercial kitchen ventilation systems. Given the presence of ignition sources and high fuel loads, it’s not surprising to learn that kitchens have been identified as the source of 25 per cent of all structural fires, and up to 50 per cent of all structural fires in commercial buildings. Such statistics make kitchens the No.1 source of building fires in Australia. Unattended cooking is often to blame, and these fires typically occur directly below the kitchen exhaust hood. Thankfully, many incidents go unreported; they are quickly contained by portable fire extinguishers and fire blankets. But it is when the fire extends into the mechanical exhaust system that human safety is compromised and considerable building damage can occur. In light of recent updates to relevant Australian Standards, as well as changes to maintenance requirements within the National Construction Code (NCC), AIRAH has developed a fire safety technical bulletin covering kitchen exhaust ventilation. This has been done in partnership with key industry stakeholders. Available free online, Fire safety – Kitchen hood exhaust systems is a valuable resource for everyone from technical service providers and facilities managers to operators of commercial kitchens, building surveyors, body corporates, local councils, property assessors and insurance companies. One of the prominent messages in the bulletin is a call for greater compliance in system design, installation and maintenance. “AIRAH believes kitchen exhaust ventilation systems and their impact on fire safety can be improved markedly within the community,” says AIRAH’s executive manager – government relations and technical services, Phil Wilkinson, F.AIRAH. “Systems must be designed and installed in accordance with the established rules and regulations. Compliance is a huge area of strategic focus for AIRAH now and into the future, and this technical bulletin is all about compliance.” IN THE EXHAUST Kitchen exhaust fires can spread in a number of ways. A fire that originates within a kitchen or at the hood filters can spread rapidly into and up the ductwork system, fuelled by the oil and grease accumulated within the duct. Once in the ductwork, high-intensity fires can be hard to locate and difficult to extinguish. Additionally they can ignite combustible materials outside of the duct via radiant heat transmission, or ignite grease that has leaked out of duct seams. Within moments, such a fire is no longer contained within a kitchen exhaust system, and spreads throughout a building. Commercial kitchen fires are an all too common occurrence in Australia. In 2014 alone, just five restaurant fires caused $30 million of damage – among them St Kilda’s iconic Stokehouse. Sean McGowan reports on the release of a new AIRAH technical bulletin that highlights the fire risks inherent in commercial kitchen ventilation systems. Out of the frying pan And because fire dampers are not permitted within kitchen exhaust ductwork, fire within and between ducts can compromise a building’s passive fire protection such as fire-rated compartments. Fire dampers, which are usually installed in ventilation ducts to prevent a fire from spreading, do not work in kitchen exhaust systems. Grease on the downstream side of the damper will ignite before – and irrespective of – damper closure. The potential for false operation of the fire damper is also greater than normal. This closure – other than in the event of a fire – can have serious consequences for kitchen ventilation. THE THREE ELEMENTS All fire risk analysis should boil down to three key elements that are required for fire to occur: fuel, oxygen and ignition. “Without heat the fire can’t begin, without fuel the fire can’t grow, and without air the fire can’t spread,” says the bulletin. For fire prevention to be effective, at least one of these elements must be disrupted, and within a commercial kitchen hood exhaust system all are highly preventable. While flare-ups are the dominant source of ignition in kitchen fires, fires can also ignite from sparks, soot from wood or charcoal burners, and even the heat generated from some types of cooking appliances. With a source of ignition present, accumulated grease within the exhaust system provides the fuel for a kitchen fire to spread. Derived from cooking, the grease enters the system with the ventilation of air. High air velocities will entrain and entrap cooking contaminants, and while filters will capture some of the grease, no filter captures 100 per cent of it. Any grease that passes through or around the filters will build up on the internal hood, duct and fan surfaces. Accumulated grease may also leak out of the ductwork through poorly sealed seams and joins, or pool in some areas to create a reservoir of highly flammable fluids and vapours ripe for ignition. The use of solid fuels in the kitchen (such as charcoal) can create volatile gases from incomplete combustion. These can condense in the exhaust duct and mix with water vapour to form a highly combustible, tar-like creosote substance that sticks to the duct. Once these combustible fuels ignite within the duct, the air movement created by the kitchen exhaust system can easily support a large fire. In such instances, the duct often acts as a chimney, channelling smoke and air to ventilate the fire. If this occurs in the reverse direction, large amounts of hot toxic smoke can enter the kitchen area and building via the hoods. These inherent dangers are why the NCC requires commercial kitchens to be fitted with kitchen exhaust hoods that comply with AS/NZS 1668.1-2015 and AS 1668.2- 2012. Both standards have been recently updated. The NCC and AS 1668.2 determines where kitchen exhaust hood systems are required, the minimum ventilation rates, the construction details in terms of functionality and hygiene, and importantly, the minimum distances between the grease-removal device and the heat source. The NCC and AS/NZS 1668.1 specify the design and installation precautions that need to be adhered to, to mitigate the results of any fire that occurs within the exhaust system. INSPECTION AND MAINTENANCE As well as addressing the design and installation of new systems, the Fire safety – kitchen hood exhaust systems technical bulletin covers some of the common problems encountered in existing systems. These include the grease-removal device being too close to the heat source, poor maintenance and/or access, split maintenance responsibilities, ducts being too close to inappropriate materials, multiple ducts from multiple compartments, wood-fired ovens and charcoal burners, and incorrect installation. All are important elements to kitchen exhaust fire prevention and should be addressed. Yet it is the continuing inspection and maintenance of these systems that ensures they remain both clean and safe. Most Australian states have legislation requiring building owners to maintain fire safety systems and submit a performance assessment to the relevant authorities each year. And in some states, kitchen hood exhaust systems and associated ductwork are considered to be fire safety systems. From a recent ASHRAE Journal article, “Fires in commercial kitchens most often start in or near appliances. Notable examples include ignition from natural gas or solid fuel flames, such as with charbroilers; ignition of cooking oil in deep fat fryers; and ignition of grease deposits in or near appliances, exhaust hoods, and ducts.”2 This article describes many factors contributing to the cause and spread of fires in commercial kitchens. Some of the descriptions come from forensic fire investigations in which the author participated, while other descriptions come from public reports. The high proportion of deep fat fryer fires among the fires described here likely relates more to the author’s particular investigation assignments than to the actual proportion of fryer fires nationwide. FIRE CASE STUDIES FROM THE AUTHOR Total loss of quick service restaurant and play area. A large amount of burnt grease was found inside the backs of three fryers, suggesting ignition from the gas burner flues. Although the fire suppression system activated, fire spread throughout the building, which totally collapsed as shown in Figure 1. Investigators noted that the kitchen equipment installation did not meet code and standards requirements for clearance to wood construction behind the appliances and exhaust hood, likely contributing to the spread of fire. Near total loss of barbecue restaurant. Fire likely started in one of three fryers, which was found nearly empty of cooking oil, causing overheating and auto-ignition, in spite of built-in safety devices. The fire suppression system discharged, although appliances had been rearranged from the original layout, resulting in a mismatch of suppressant nozzles and appliances, with less suppressant discharge to the burning fryer. Fire spread was accelerated by wood facing on walls and ceiling. Total loss of quick service restaurant. Fire started in fryers under a low profile hood. The fire suppression system did not activate automatically, likely because fusible links were coated with hardened, decomposed grease, as shown in Figure 2, nor was the system manually activated by workers. Fire escaped the hood through a 100mm by 300mm rectangular hole inappropriately cut into the rear top of the hood for passage of electric conduits for fryer cooking timers. Fire spread to the void space between the duct and surrounding fascia metal, and because of inappropriate sealing of the duct at the ceiling, fire spread to the attic and roof, where wood construction burned and two-thirds of the building collapsed. Total loss of two-story building with Italian-themed restaurant. After closing, fire started in a deep fat fryer that was not properly turned off. Post-fire testing confirmed that the fryer thermostat did not work properly and the separate high-limit switch was improperly wired, enabling runaway heating and auto-ignition of the cooking oil. Because the fryer was halfway outside of the left end of the exhaust hood, rising flames were not contained by the hood and ignited the ceiling and second story. Also, the improper fryer position likely delayed fire detection because there was less heat near the fusible links. After activation, the suppression system discharged only one of two liquid agent cylinders, while fire spread to the entire building. Total loss of convenience store and café portion of two-story motel. This fire started in a fryer under a low-profile hood. The unique hood design likely delayed automatic activation of the fire suppression system, and manual activation of the fire system was not attempted because there was no manual pull station in the front kitchen in which the fire occurred. Instead, for this single-fire system that covered hoods and appliances in two kitchens, the manual pull station was in the back kitchen. Firefighters extinguished the fire under the fryer hood and left the scene after posting a fire watch outside. Flames were later seen burning through the second story roof. Investigators concluded that after firefighters left the first time, fire continued to burn in the fryer hood duct and ignited wood ceiling joists that were only 75mm to 100mm from the duct, with insufficient clearance, as shown in Figure 3. Although firefighters returned to fight the fire, the entire two story structure was destroyed. Total loss of quick service restaurant. Fire started in a group of several fryers. The fire suppression system activated, but a small rubber sealing washer was missing in the threaded connector between the propellant gas cylinder and the release mechanism. This allowed gas pressure to dissipate immediately after activation and no liquid suppression agent was discharged. The black washer was found in a pool of blackened grease on the bottom of the fire system cabinet. Damage to fryer area of quick service restaurant. Investigators discovered that fire started in a power distribution assembly behind multiple electric fryers. One high-power receptacle was found to be completely disintegrated, and black “carbon tracking” was visible on the corresponding white-bodied power plug. Grease deposits in the receptacle apparently carbonized and became conductive, forming an electric short circuit that heated grease deposits sufficiently to ignite the fire. Total loss of quick service chain restaurant. Investigators determined that a grease deflector baffle was missing from the fryer hood, such that liquid grease flowed downward from the hood and duct into the center fryer flue, where it was ignited by the gas burners. The fire system activated but failed to discharge suppressant because the propellant gas cartridge was not installed in the release assembly. Instead, it was lying on the bottom of the fire system cabinet. Fire spread was aided by two issues related to the fryer exhaust duct, as shown in Figure 4. • From a previous remodel, the fully welded steel duct was cut and extended with a section of thin galvanised vent piping, with loose-fitting sleeve connections that allowed fire to escape from the duct into the attic; and • There was insufficient clearance from the duct to wood trusses in the attic. Total loss of quick service restaurant in remodeled historic building. Fire started in the rear of a set of fryers. The fire was caused by an accumulation of grease inside the fryers near the hot gas burner flues, as shown in Figure 5. Some of the grease sprayed toward the flue area from a cooking oil leak in plastic piping added with the installation of a third-party cooking oil disposal and replenishment system. The fire system activated but did not prevent fire spread and loss of the entire historic building. Damage to fryer area in a quick service restaurant, with significant smoke and water damage. Fire likely ignited in a fryer with its cooking oil level below the level of the operating thermostat, leading to continuous heating. Separate high-temperature limit switches were not operational on three of the four fryer vats, including the burning vat. From a security video, fire system automatic activation was delayed about eight minutes, likely because of two issues that reduced hood airflow and heating of the fusible links: • Old, unlisted mesh filters in the fryer hood were clogged with grease; and/or • The fryer exhaust fan was not operating because of a broken drive belt. The security video also showed that instead of activating the manual pull and then optionally using the appropriate Type K extinguisher, workers discharged an ABC extinguisher toward the fire, resulting in an unwelcome powder flare-up. Thereafter, workers looked closely at the nearby manual pull station for a few seconds, but they did not manually activate the fire system before evacuating the building. FIRE CASES FROM OFFICIAL REPORTS Solid fuel fire at full-service restaurant in airport terminal. A fire ignited in a hood and duct over a solid fuel charbroiler and a solid fuel rotisserie. The fire inspector’s report included these observations:3 • Fire occurred in plenum and duct of solid fuel cooking appliance hood; • Grease filters had build-up of ash and grease; • Extensive charring and ash in plenum of hood; and • Grease build-up on wall under hood. Firefighters extinguished the fire with limited damage, and although the gas cartridge seal was found punctured, the fire inspector noted several issues with the fire system: • Hood suppression release mechanism in cabinet indicating (sic) discharge; • Manifold piping burst disk unaltered, indicating no discharge of liquid; and • Chemical suppression agent tanks full. From the inspector’s observations, it’s likely the gas cartridge was previously used or it was improperly installed in the release mechanism, either of which suggests improper maintenance of the system. Partial damage from solid fuel cooking fire. According to the fire report:4 “The cook said when the fire in the pit got going, a fire started in the flue (duct). He was able to put the fire out in the pit and tried to put the fire out in the flue with his extinguisher. The flue fire wouldn’t go out.” The report implies that the fire suppression system activated but did not extinguish the fire in the duct. Partial damage of bowling center snack bar. A fire ignited in the cooking area of a bowling center snack bar, reportedly from a deep fat fryer, and it spread upward into a long vertical duct. According to the fire marshal’s report:5 • FM (fire marshal) arrived on scene and found fire coming from the hood exhaust fan on the roof; • The suppression system operated but did not extinguish the fire; and • Witnesses advised hood suppression activation seemed to be delayed. The author’s opinion is that the fire, aided by exhaust airflow, spread upward into the long vertical duct quicker than the suppression system could act on it. OTHER CASES Appendix B of Reference 1 includes brief summaries of 13 fire incidents in eating and drinking establishments. The descriptions include five incidents in which hood fire suppression systems did not operate, or did not operate properly. In one case, the suppression system put out the fire under the hood, but the fire continued in the duct and was eventually extinguished by firefighters. LESSONS LEARNED Here’s a summary of lessons learned from the fires described above, published reports, and fire scene observations by the author. Fire training Restaurant workers must be trained in fire protection and suppression procedures, including: activating fire alarms and/or calling 911; manual activation of fire suppression systems; optional use of Type K, not ABC extinguishers; and orderly evacuation of themselves and customers. A required placard mounted over Type K liquid fire suppressant extinguishers warns that fire suppression systems should be manually activated before use of Type K extinguishers. Fire system maintenance and performance Specified maintenance is required by codes, standards, and listings, with minimum performance and other checks at least every six months. Newer, electrically supervised fire systems can alert workers to situations that might prevent systems from functioning properly. Also, modern fan controls can be integrated with hoods and fire systems to anticipate hazards and disable cooking appliances before a fire event occurs. Hood overhang and appliance placement Design overhang of hood fronts and ends over appliances must be maintained, not only to aid hood capture and containment performance, but also to minimize fires spreading outside hoods. From another perspective, appliances must be located within the design hazard zone of the fire system and properly positioned under fire system nozzles. When appliances are rearranged, fire system piping and nozzles must be adjusted to conform to new appliance locations, unless overlapping coverage is provided. Full height end panels, caster locks, caster cups, and tethers are examples of appliance locating mechanisms. Clearance to combustibles Clearance issues often cause small fires to spread and increase damage. The most frequent non-conforming issue observed by the author is hoods and ducts mounted without required clearances to nearby wood construction. Clearance requirements are contained in model codes and standards, including the International Mechanical Code®, Uniform Mechanical Code, and NFPA 96® Standard for Ventilation Control and Fire Protection of Commercial Cooking Operations. Hood and duct integrity In some of the previous cases, code-required integrity of Type I hoods was compromised by improper design, construction, and installation. With cooking that produces grease and smoke, requiring Type I hoods, it is common to specify: • Listed hoods (UL 710 – Exhaust Hoods for Commercial Cooking Equipment); • Listed grease filters (UL 1046 – Grease Filters for Exhaust Ducts); and • Listed exhaust fans (UL 762 – Power Roof Ventilators for Restaurant Exhaust Applications). The additional specification of factory-built, listed duct products (UL 1978 – Grease Ducts) is a means of significantly improving duct integrity. Hood, duct, and appliance cleaning Depending on the types of cooking and foods cooked, hoods and ducts must be frequently and thoroughly cleaned to remove flammable grease. Cleaning should also include removal of grease from inside and around appliances. Hoods and ducts over appliances with solid fuel cooking need more frequent and aggressive cleaning to remove flammable creosote as well as grease. Hoods are available with daily self-cleaning functions for the hood plenum and duct, and there is a professional organization that certifies commercial kitchen exhaust system cleaners and supervisors. Electricity and grease don’t mix When grease from cooking deteriorates, its auto-ignition temperature decreases as it carbonises and becomes conductive. This can lead to grease ignition in electrical connections and receptacles, and hood fire suppression systems might not protect cramped areas behind appliances. 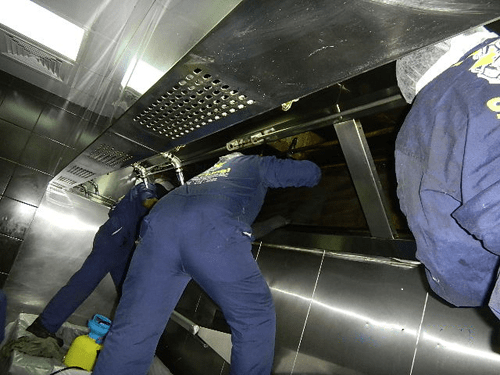 Exhaust fan maintenance Exhaust fan operation is important; specified airflow carries heat toward fire detectors, as well as grease into filters and other cooking emissions out of the facility. Broken exhaust fan belts are common, and preventive maintenance should include periodic installation of new belts. Exhaust air proving controls are recommended to ensure that exhaust fans are running and exhaust air is moving. Solid fuel cooking Reference 6 suggests, “Solid-fuel appliances dial up the threat with the addition of highly combustible materials.” While nearly all cooking releases grease particles and vapors from foods, leading to deposit in hoods and ducts, solid fuels also produce embers and creosote. Also, conventional fire suppression systems have a fixed volume of suppressant and they discharge the suppressant for a limited time – in the range of 45 to 60 seconds. This time may be insufficient to extinguish fires and prevent re-ignition, particularly in burning hoods and ducts with creosote deposits. For solid fuel cooking, the author suggests that designers and engineers consider specifying the latest technology for commercial kitchen fire suppression systems, such as systems with electronic monitoring and operation, electronic detection by temperature and rate of temperature rise, battery backup, unlimited cold water for suppression, automatic daily hood cleaning with hot water, and surfactant addition for both suppression and cleaning to reduce the surface tension and make water “wetter” for improved removal of flammable deposits. These systems add an electronic detector under each exhaust fan inlet to better detect duct fires over solid fuel cooking, and listed ducts are highly recommended. SUMMARY There are many causes of commercial kitchen fires, and kitchen fire suppression systems sometimes don’t extinguish fires, leading to spread of fires with increased damages. Lessons learned suggest that designers, builders, building code and fire officials, equipment suppliers, owners, and others should work toward improved fire prevention and suppression in commercial kitchens. Codes and standards serve a real purpose in preventing fires, although education, strict inspection, and full compliance are necessary. BIBLIOGRAPHY “Restaurant Building Fires.” 2011. U.S Department of Homeland Security, U.S. Fire Administration, National Fire Data Center, Topical Fire Report Series, Vol. 12, Issue 1. Given the presence of heat and high fuel loads, fires in kitchens are not uncommon. However, when the incident extends into the mechanical exhaust system, safety risks and building impacts can rapidly escalate, sometimes resulting in devastating and widespread damage. In the first of a two-part bulletin, Skills Workshop will discuss and address the special fire risks inherent in commercial kitchen ventilation systems and offer best-practice approaches to take in order to minimise the risks. FIRE FACTS Duct fires can be intense and reach temperatures of 1,000°C within minutes – hot enough to melt some metals and ignite surrounding combustibles. Fire statistics from Australia, the UK and the US show that fires in restaurants predominately occur in kitchens. The ignition of cooking materials accounts for almost half of all commercial kitchen fires and almost all of these (90 per cent) get into the kitchen hood exhaust system. Many restaurants never re-open after suffering a fire loss. Insurance policies may exclude claims related to uncleaned or grease-laden exhaust ducts. 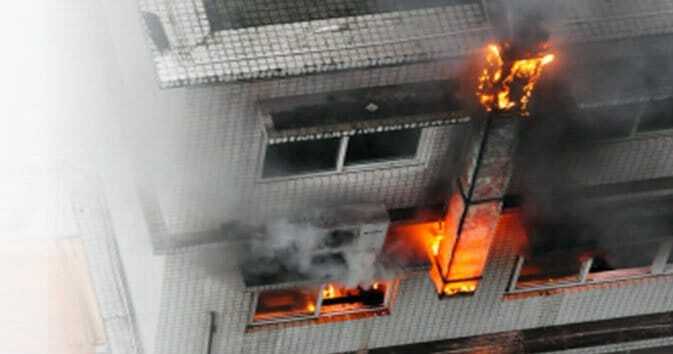 Insurers are aware of these fire risks – are you? Always read the small print! KITCHEN EXHAUST FIRE HAZARDS Fires are common in restaurants and typically start in the kitchen area. Cooking materials are the most frequent “first item” ignited. Experience shows that the majority of kitchen fires will involve the kitchen exhaust hood or ductwork. Kitchen exhaust fires can spread in a number of ways. A fire that originates within the kitchen or at the hood filters can spread into and up the ductwork system, fuelled by the oil and grease within the duct. A fire within the duct can ignite combustible materials outside of the duct, via radiant heat transmission, or can ignite grease that has leaked out of duct seams, spreading the fire in the building. Because fire dampers are not allowed within kitchen exhaust ductwork, fire spread within and between ducts can compromise a building’s passive fire protection such as fire-rated compartments. Fire dampers, which are usually installed in ventilation ducts to prevent fire spread, are not permitted within a kitchen exhaust duct system. They do not work in kitchen exhaust because grease on the downstream side of the damper will ignite before, and irrespective of, damper closure. The potential for false operation of the fire damper is also greater than normal and closure, other than in a fire situation, can have serious consequences for kitchen ventilation. Restaurants in buildings are a fire hazard. When a restaurant is located in a larger building or complex, such as a hotel, hospital, mall, airport or multi-storey residential development, the risks increase exponentially. A fire in a kitchen exhaust system in Heathrow Airport shut down three terminals, delayed or cancelled hundreds of flights, and generated hundreds of millions of dollars in losses that far exceeded the physical damage bill. That fire spread through 200m of exhaust ductwork to a plantroom before it was extinguished. Fuel: The grease derived from cooking processes enters the system with the ventilation air. High air velocities help to entrain and entrap cooking contaminants. Grease filters will capture a percentage of this, depending on their performance efficiency, installation quality, and cleanliness management. No filter captures 100 per cent of the grease, and any grease that passes through or around the filters will build-up on the internal hood, duct, and fan surfaces. Accumulated grease can leak out through duct seams and joins, or can pool in some parts of the ductwork to provide reservoirs of warm, highly flammable fluids and vapours that are ripe for ignition. Solid fuel cooking can create volatile gases created by incomplete combustion of the wood. These gases condense in the exhaust duct and mix with water vapour to form a tar-like creosote substance that sticks to the duct. Ignition: There are many ignition sources within commercial kitchen environments: open-flame cooking devices, flaming cooking techniques, sparks and soot from wood or charcoal burners, even the heat generated from some types of cooking appliances can provide enough energy to ignite warmed grease, which then only needs a supply of oxygen to continue burning. Flare-ups from cooking equipment are the dominant cause of ignition. Oxygen: The primary purpose of the ventilation ducts is air movement, so there is more than enough air available within the duct system to support a large fire. Once combustion commences the duct often acts as a chimney, channelling smoke and air to ventilate the fire. If this occurs in the reverse direction, large amounts of hot toxic smoke can enter the kitchen area and building, via the hoods. Fire-related hazards in a kitchen include: • Flames, sparks and hot gases from food preparation can ignite residues in exhaust ducts • Food preparation equipment left without supervision during operation • Failure to switch-off equipment, especially at the end of activity • Overheated oils that can lead to spontaneous combustion • Food preparation equipment based on solid fuels • Gas blowtorches used for browning some foods • Poorly operating thermostats or lack of thermostat or fault-detecting equipment • Faulty or overheating electrical equipment • Metal exhaust flues that conduct heat and ignite nearby material or debris • Ovens without igniters/pilot lights (lit with burning pieces of paper). ADDRESSING THE FIRE RISKS Meeting the latest standards Compliance with the relevant standards is very important. The National Construction Code (NCC V1 2016) requires that commercial kitchens are provided with kitchen exhaust hoods in compliance with AS 1668.1-2015 and AS 1668.2-2012. In order for a hood to comply with AS 1668.1, the whole exhaust system must comply. These standards have been updated and it is important that designers and installers are working to the correct editions. The NCC and AS 1668.2-2012 determines where kitchen exhaust hood systems are required, the minimum ventilation rates, the construction details in terms of functionality and hygiene and, importantly, the minimum distances between the grease removal device and the heat source. The NCC and AS 1668.1-2015 specifies the design and installation precautions that need to be included to mitigate the results of any fire that occurs in the exhaust system. AS 1668.1 requires 300mm separation or fire insulation between ducts and combustible materials, and separate shafts for kitchen exhaust ducts from different compartments. Flame barriers (in accordance with UL 1046) are required in hoods under some circumstances, such as when the length of kitchen exhaust ductwork within the building exceeds 10m in length or where exposed flames or embers are part of the cooking process. Where appliances can produce sparks – e.g. solid-fuel ovens – a spark arrestor is required at the connection. Systems that are already operating should not shut down in fire mode. Where located in a building required to have fire sprinkler protection to AS 2118.1-1999 or AS 2118.4-2012 kitchen exhaust systems must also be protected with sprinklers. Both standards require sprinklers to be installed under kitchen hoods and within kitchen exhaust ductwork. Pre-engineered fire protection systems: It is recommended that pre-engineered fire protection systems, in accordance with AS 3772-2008, be installed instead of sprinklers within kitchen hoods to protect cooking equipment such as deep fat fryers, sprinklers are still required in the ductwork. These are typically wet (water/chemical) suppressant based systems that require an alternative solution to meet the requirements of the NCC and should be maintained in accordance with AS 3772. Grease filters If the cooking process generates grease or oil, and most do, then AS 1668.2 requires that grease filters or grease removal devices are provided to reduce grease entering the exhaust duct. There must be a minimum distance between the grease removal filter and the cooking surface – 1350mm for open-fire cookers (charcoal or wood fires), 1050mm for naked flames (gas cooking), and 600mm for electric plates and rings. Filters should be easily accessible and removable for cleaning and be installed at an angle not less than 30 degrees from vertical. Grease particles can be broken down into three size categories: grease smoke particles ranging from 0.03 to 0.5 microns, grease steam particles (grease-covered moisture particles) ranging from 0.5 to 6.0 microns, and grease spatter, or larger visible particles ranging from 6.0 to 150 microns. Different filter designs work better for different particle size ranges and not all devices can capture all particle sizes effectively. High temperature cooking processes convert some grease into the gaseous phase which cannot be captured by filters and eventually condenses and accumulates on ductwork walls. Grease filters can’t prevent grease entry into the exhaust system but they can reduce entry and extend the length of time required between duct cleaning. Ductwork AS 1668.1 requires ductwork outside of dedicated fire-resistant shafts or structurally independent fire-resistant enclosures to be manufactured from 1.2mm galvanised steel, 0.9mm stainless steel, or equivalent. Ducts must be vertical where practicable. Ducts that are not vertical must be graded upwards (at least 1:200) in the direction of airflow allowing grease and moisture to drain back towards the hood. Drainage points fitted with a grease tight tap or plug must be provided, as well as access panels/ cleanout hatches at each change in direction and every 3m run of (non-vertical) ductwork. Access panels must be airtight and not compromise the fire integrity of the exhaust duct. Joints and seals must be grease tight; fully welded, rivet and soldered, or be sealed with a liquid mastic or sealant that is unaffected by water, grease or cleaning solvents. Flexible connections must be grease tight, grease proof, fire resistant and not longer than 300mm. Vertical ducts are safer ducts: Horizontal duct runs should be minimised on all systems as there is a high risk of grease build-up and grease leakage in these sections. They also have the potential for the reverse flow of smoke into the kitchen during a fire event. Ducts should be vertical and take a direct route (or as short as possible) to the outside. Given the presence of heat and high fuel loads, fires in kitchens are not uncommon. However, when the incident extends into the mechanical exhaust system, safety risks and building impacts can rapidly escalate, sometimes resulting in devastating and widespread damage. In part two of this Skills Workshop series, we will discuss seven of the most common safety faults often discovered in commercial kitchen exhaust ventilation systems. Systems that are not periodically inspected, maintained or cleaned will be subject to a buildup of oil, grease and other inflammable materials within the duct, filters, gutters, and on the internal surfaces of the hood. Systems that are not properly maintained present a higher risk of a significant fire event. Systems cannot be adequately inspected or maintained if the cleaning contractor cannot access and clean the internal duct surfaces. AS 1668.2 requires that access panels “large enough to enable cleaning of ducts” are provided in the ductwork at every change in duct direction and at least every 3m for horizontal duct runs. If access cannot be achieved, the duct cannot be cleaned, and this will generate a significant and ongoing fire hazard. In some cases a building owner and a building tenant will have split responsibilities for system maintenance and cleaning, because the hood and filter are located within the tenancy, and the exhaust duct and fan are located in a common or core building area. In these circumstances the scheduled maintenance programs should be coordinated and the individual responsibilities made explicitly clear. Ultimately it is the building owner that holds the regulatory responsibility for fire safety at the premises. fire hazard. Ductwork must be installed at least 300mm away from any combustible material or be insulated to achieve a fire-resistance level (FRL) of –/30/30. Ducts penetrating any fire-rated floors, walls, and ceiling/floor or ceiling/roof systems must be installed so that the required FRL of the building element is not compromised. This generally means that the duct has to be enclosed in a fire rated enclosure or in fire-rated construction.Other trades or kitchen staff, who are not aware of the danger of locating combustible materials near or on kitchen exhaust ducts, also need to be considered. Hoods and ducts should never be used as storage or shelving space. Signs can be used to educate staff. Over time, as a building’s configuration or usage changes, kitchen exhaust systems are often extended or added. AS/NZS 1668.1 does not allow kitchens within different fire compartments to share the same exhaust ductwork or fan. Kitchens in separate compartments must have separate systems with separate fire-isolated shafts, ducts and fans. Because of the increased ignition risk imposed by solid fuel (wood and charcoal-based cooking fuels), these types of cooking appliances must now be provided with separate, independent ventilation systems and spark arrestors. Existing older systems may combine spark-producing and grease producing cooking appliances within a single system. This high-fire-risk practice should be reviewed and mitigated by installing scrubbers or water sprays in the duct, separating the exhaust systems, or installing a pre-engineered fire protection system. Systems may have been incorrectly designed and installed from day one. Ducts should be installed vertically or near-vertically, with horizontal runs graded towards a drain and provided with access/cleanout hatches.Standard-gauge ductwork must not be used; bracing should not promote excessive grease build-up. Ductwork seams must be grease-tight, otherwise grease will leak out onto ceilings and roofs, generating a secondary fire hazard. Exhaust fan(s) must be able to handle grease build-up, must have the motor and drive located out of the airstream, and be capable of withstanding 1000°C without melting or burning. Making systems safe: Pre-engineered fire-suppression systems can be installed in the kitchen hood to provide added protection. Hood filters can be re-designed as fire baffles to reduce flame penetration into the duct. Ducts can be sealed to prevent leaks, and access improved to facilitate cleaning. Fire wrapping new or existing kitchen exhaust ductwork with fire-retardant blanket materials, specially designed for the purpose, can improve fire safety; ensure the duct is fully sealed and airtight prior to wrapping. These additions or modifications can provide the gold standard in kitchen exhaust safety or be used to help make an unsafe system safe again. Most Australian states have legislation requiring building owners to maintain fire-safety systems and submit a performance assessment to the relevant authorities each year. Kitchen hoods and associated ductwork are considered fire-safety systems in some states. Owners and operators also have a duty to keep systems clean and safe under work health and safety (WHS) regulations and under the food safety standards for commercial kitchens. AS 1851-2012 outlines a series of minimum inspection, maintenance and record-keeping activities for the fire and smoke-control features of air-handling systems. It includes protocols for kitchen exhaust systems and any associated fire-protection sprinkler systems. Manufacturers of kitchen exhaust systems often provide their own inspection and cleaning programs, which may be more stringent or frequent than those in AS 1851. In the event of a fire, failure to comply with these may be deemed as negligent or a failure of duty. The US standard ANSI/IKECA C10 and the UK Guide HVCA TR19 Section 7 both provide a publically available standard for cleaning of commercial kitchen exhaust systems. This can be used in maintenance procurement and validation. As well as specifying quantified system inspection procedures, these documents define acceptable cleaning methods for system components, and set post-cleaning acceptance standards. • Check grease-arresting filters for excessive grease accumulation. Clean grease filters where required. Note: Grease filters can be cleaned in dishwashers or cleaned off-site to manage grease waste disposal. • Check grease gutters for any excessive grease accumulation. • Check that grease-arresting filters are secured in position and free of damage. • Check the internal surfaces of the exhaust plenum behind the filters for excessive grease accumulation. If there is grease accumulations, ensure that air is not bypassing around the filters. Note: Filters are the first defence against grease spread. Depending on the type of cooking and the volume of usage the cleaning of grease filters could be required more frequently than monthly, including weekly or even daily. • Clean the hood and its exhaust plenum. • Check for excessive air leaks at grease-arresting filters and replace filters if necessary. maintenance. Only properly trained and qualified personnel should perform this maintenance. Note: The frequency of the entire exhaust duct system inspection should relate to the usage of the facilities. flashing over violently causing a ceiling to collapse on the fire fighters below. You know the old saying – if you can’t stand the heat, get out of the kitchen! While its meaning may ring true, in the modern world of safe working environments and occupational health and safety, an overheating kitchen can be a sign that all is not as it should be. This month, Sean McGowan peers into the world of commercial kitchens. If you’ve ever walked into a restaurant, café or take away food outlet and been hit by the horrible aroma of dirty grease rather than the alluring smell of your favourite food, then I hope you’ve walked straight back out the door and into another establishment. Because that smell can only mean one thing – someone is not doing their job and the kitchen’s exhaust system is in serious need of a good clean, and perhaps, overhaul. Furthermore, the kitchen may be a high fire risk and a not so safe environment for both staff and patrons. It’s a subject many kitchen owners don’t seem to fully appreciate. And because kitchen exhaust systems are largely out of view from the general public – like so many other HVAC&R services – their cleanliness and safety is often taken for granted. Kitchen exhaust systems play an incredibly important role in the commercial kitchen. Not only do they remove heat, odours and grease from the kitchen environment. They also remove some very serious gases, including carbon dioxide, carbon monoxide and nitrogen dioxide; which may be produced while the kitchen cooking equipment is in use. While good design, equipment selection and installation all remain important pieces of the puzzle, the real key is regular maintenance – which takes time and money – and unfortunately for some, goes on the back burner (excuse the pun!). Maintaining a healthy system A typical kitchen ventilation system has four main components – a rangehood canopy located above the cooking equipment (grill, hot plate, gas burners, fryers etc); filters installed within the rangehood; ductwork connecting the rangehood to the exhaust fan; and the exhaust fan itself. These all work together to extract any polluted air out of a busy kitchen, allowing fresh air to replace it. But when one thing breaks down, inevitably the rest tends to follow. As such, each component requires a degree of maintenance to ensure they operate as required, and on the frontline of the system are the rangehood and filters which require the most maintenance. “Filtering plays a very important function in removing fatty vapours from the extracted air above the cooking appliances and preventing vapours being deposited within the ducts and to a lesser extent, to the atmosphere. Fats lodged within the ductwork are a serious fire risk,” explains Greg Payne, general manager of the Hendry Group. It’s widely considered that an average kitchen should be cleaning their filters every second or third week, with weekly cleaning required where the size and use of the kitchen demands it. According to Payne, “kitchen exhaust system maintenance needs to be based around Australian Standard AS 1851.6 which details the minimum standard for the Maintenance of Fire Protection Systems and Equipment, although in New South Wales, the installation standard sets the level at which the kitchen exhaust system must be maintained to. Fire safety schedules or essential safety measures schedules for the applicable building will set out the maintenance compliance requirements. “Maintenance is a real issue over the long term. A regular routine, balanced to have regard to the nature of the cooking process, is a must for the filters. For example, a high percentage of deep frying or grilling will require a more regular filter cleaning regime. Canopies over ovens and dish washers could have longer periods between filters being changed,” Payne says. The maintenance schedules are usually produced at the time of the approval (New South Wales) or at the completion of work (Victoria), with the regulatory body, such as the local council or private certifier or building surveyor issuing these schedules. While maintenance requirements are specified, it still remains that many kitchen operators go about their business with scant regard for the levels of maintenance required, and the risks associated with non-compliance. Payne says this can, in part, be attributed to the cost. “As with the maintenance of any other fire safety feature installed in a building, maintenance to specified mandatory and regulated requirements is problematic and cost dependent,” he says. “Owners who lease food premises are particularly at risk from tenants who have little regard to maintenance. The owner and the tenant can be liable where a fire in the kitchen exhaust duct subsequently causes the whole building to be fire damaged beyond repair. Other tenants and their livelihood are affected and litigation is a common path taken to recoup losses. “Contractors who perform non compliant work can also be liable if it is shown their work contributed to the fire expanding into the rest of the building,” he says. Kitchen nightmares One man who sees the best and worst of kitchen maintenance is Richard Fudge, operations manager for Metropolitan Filter Services in Parramatta, which services over 4000 restaurants across Sydney, Newcastle and the Blue Mountains. He says that when filters are full of grease, it is transferred to the hood and released into the gutter for cleaning out – but when too much grease is in the hood it can travel up the duct and spill out, creating an environmental issue and a fire risk. And unfortunately, there are many restaurants which allow this to happen. “The easiest way to keep your system going is to keep your filters clean. A record of this process must be kept in case of fire, and the cheapest and easiest way is to get a qualified professional to do it for you,” Fudge explains. He believes the best way to clean filters effectively is with high pressure water. His company has worked with Sydney Water to develop an enclosed system to ensure the waste water does not contaminate the environment. Instead, it is pumped out twice weekly and used in the manufacture of fertiliser. “Unfortunately there are many companies that don’t take so much care, and flush highly dangerous acids, grease and waste into our water ways. I’ve even seen people cleaning filters at car washes,” he says. Aside from regular filter cleaning, ductwork also requires regular cleaning to prevent the build-up of grease, which can become a fire hazard. “Once again the simplest way to avoid these problems is to get a service company to create a maintenance schedule,” says Metropolitan Filter Services’ Fudge. “This should involve ongoing regular filter exchange, quarterly hood clean inside and out, and six or twelve monthly full system cleans of the ductwork and fans.” However, Fudge says the regular maintenance of ductwork is a major problem that needs urgent attention by the authorities. “There is an Australian Standard for the cleaning of ducts but nobody follows up on people’s work to check they comply. It’s too easy to be told its all clean, but in reality very few people check the work has been done,” he says. According to Essential Property Services, a division of the Hendry Group, the maintenance routine of a commercial kitchen in most jurisdictions where it needs to meet the minimum standards set out in AS 1851.6, should reflect the following: Level 1 (1 to 6 month intervals depending on the volume of usage) The items required for a level 1 routine should include the following: • Check grease-arresting filters for excessive grease accumulation. • Check hood and its exhaust plenum for excessive grease accumulation. • Check that grease-arresting filters are secured in position and free of damage. • Check grease gutters for any excessive grease accumulation. Level 2 (1 to 6 month intervals depending on volume usage) • Clean or change over grease-arresting filters. Note: Due to the wide variation in usage, the frequency of this routine is subject to the requirements of the relevant regulatory authority. Level 2 routines may be required more frequently than a level 1 in some circumstances. Level 3 (Annually or more often should usage be of high volume) The action items required for a level 3 routine should include the following: • Clean hood and its exhaust plenum. • Check for excessive air leaks at grease-arresting filters. • Check duct back to motor for accumulated grease and clean it. In New South Wales, the fire safety measures attributable to the kitchen exhaust systems is the installation standard AS 1668.1 under BCA F4.12 and AS/ NZS 1668.1 which establishes the level of performance to be achieved by the maintenance regimes adopted. An owner who uses competent people and strictly complies with AS 1851.6 could be regarded as meeting the above requirements. Note: Fire protection or suppression systems installed within kitchen exhaust systems may have special requirements requiring additional mandatory maintenance. Design, selection and installation Sizing of exhaust hoods, duct work and exhaust velocities are critical issues in the design, selection and installation of commercial kitchen exhaust systems. Undersized rangehoods inevitably lead to positive pressure, which manifests itself into smoke and effluent from cooking remaining in the kitchen, making it both a hot and uncomfortable working environment. It can also lead to odours entering the restaurant dining space. According to Peter Britton of Stoddart Manufacturing, manufacturers of the Halton range of exhaust systems under licence in Australia, the key to an effective system is to keep the exhaust volumes as low as possible to ensure you are exhausting all the polluted air, without removing the fresh air from the kitchen. “You need to be able to balance the effective capture of the (heat) plume, with makeup air and also the cool environment of the kitchen.” Exhaust rates should be directly related to the quantity of convective heat produced by the cooking equipment. If excess heat and impurities are not captured by the hood and are spread through the rest of the kitchen area, then the exhaust rate needs to be increased. Another component critical in the makeup of the exhaust system is the fan, which again when incorrectly sized, can result in the entire system not functioning as intended. “The size of the fan is very critical depending on the size of the canopy, the size of the ducting and the distance of the ducting away from the canopy before exhausting out. The type of filter also has to be taken into consideration,” says Shab Ticklay of Kaleya Filters. One of the common reasons behind undersized kitchen exhaust systems is the high level of turnover in restaurant spaces, and subsequent remodelling upon the space being re-let. Where once systems were designed to meet the requirements of an original setup (calculating floor space, cooking appliances etc); new owners subsequently knock down walls and add windows and doors without making any changes to the existing exhaust system. This has obvious consequences. “It disturbs the balance,” says Fudge. “Some hoods don’t work at all and others struggle to keep up (with the new demand). People then turn up the air conditioning to compensate and subsequently ruin entire HVAC systems.” Another common design error rests in the selection and installation of duct work. According to Britton, ductwork used for extraction should always be installed so it slopes backwards, ensuring it is self draining. “The Australian Standards call for the duct to slope back to the filter, and this is always a problem. It’s one of those contributing factors to fat being stored in the duct, and as soon as fire starts, off it goes. It can be very quick,” Britton warns. Other common faults include the discharge being at the incorrect height above a roof, the location of the discharge in relation to outside air intakes, and the reticulation of ductwork on the face of a building which is not usually allowed and can have significant planning consequences. Payne suggests that some manufacturers and installers do not have regard to code requirements and statutory permit requirements, or are simply unaware that these are in place. “We also find occasions where the ductwork is not fire rated when it is within proximity to combustible materials or if it is within a shaft, the shaft also tends to be used for other services. This is not permitted as the kitchen exhaust must be in its own fire rated shaft because duct penetrations are not allowed to be protected by fire dampers,” he explains. He says other issues regularly encountered include a lack of access panels provided to enable effective cleaning of the duct, particularly at changes in direction; and for access to sprinklers and detectors when installed. Keeping cool in the kitchen A 2005 US report by the Restaurant Opportunities Centre of New York, and the New York City Restaurant Industry Coalition found that nearly half of the 530 kitchen workers surveyed reported unsafe temperatures in the kitchens where they worked. This report has triggered the American Society for Heating, Refrigeration and Air-Conditioning Engineers (ASHRAE) to fund research into thermal comfort in commercial kitchens. “Understanding thermal comfort in commercial kitchens is paramount to understanding and providing a controlled and comfortable environment for kitchen workers,” says Greg Duchane, a member of ASHRAE’s technical committee 5.10 on kitchen ventilation that is overseeing the project. “This research can be used by engineers and kitchen consultants in designing HVAC systems and in the operation of restaurants. It will give us more accurate understanding of employee comfort and how employees are impacted by heat loads.” In Australia, there are no regulations specifying standards for maximum temperatures in kitchens. However, according to most state OH&S guidelines, the most comprehensive heat stress index is measured by the Wet Bulb Globe Thermometer (WBGT), which takes into account factors likely to be significant in effecting a person performing work in a hot environment. These include factors which interact with each other to determine the level of heat-related risk to a worker, and include environmental conditions; the type of work being done; the way in which the work is organised; and the clothing being worn. As such, it remains the responsibility of the employer under state OH&S legislation to provide and maintain a safe working environment for employees with a temperature range that is comfortable and suitable to the work. Furthermore, employers need to ensure workplaces that are buildings must also provide natural ventilation or mechanical ventilation in accordance with AS1668, and that in enclosed workspaces comfortable rates of air movement are maintained. According to a Queensland Government Department of Industrial Relations fact sheet on heat stress in the café and restaurant industry, “an ideal working environment should have a temperature range of 20°C to 26°C and a relative humidity between 40% and 70%.” To this end, Britton is of the opinion that when installing a cooling system for a kitchen area, an evaporative system is preferable over the more common split system solution. “I’d be putting in evaporative cooling which has a bit more moisture and humidity in the air, because you’ve got so much radiant heat with cooking that you really need to keep some moisture in the air,” he explains. So next time you eat out and smell grease before your meal being cooked, or see kitchen staff dripping from perspiration, it might be time to find another restaurant. An internal investigation into the deaths of two Boston firefighters during a response to a restaurants kitchen fire on August 29, 2007 has divided the public, driven wedges between the firefighters union, the fire commissioner and the city government, and led to accusations of cover-up and finger-pointing. All sides involved, though agree that the blaze reached its deadly opogee because of a faulty kitchen ventilation system. The unions board of inquiry released on Feb 22 its final report, in which it stated “the substandard construction, installation and maintenance of the kitchen hood, duct and exhaust system, along with the degradation of the ductwork were the underlying factors involved in this fatal fire accident. Fire of this sort are “incredibly problematic,” according to Tim Saw, executive director of the international Kitchen Exhaust Cleaning Association. The fire in Boston, he noted, was directly cause by “improper cleaning … compounded by a separation in the ductwork that had never been properly repaired or noted on the service report.” “The general public, “Shaw said, “are at a great risk in many cases and local jurisdictions are burdened with an overwhelming number of (facilities) to inspect and too little staff and funding to do so… No one who eats a meal in a restaurant is aware that the restaurant could catch fire at any time. “To many restaurateurs and facility managers, getting the exhaust cleaned is at the bottom of their priority list and budget. They often contract the lowest bidder… to clean a substantial system. The contractor cleans what the manager can see and cashes the check, leaving the grease building up in the ductwork and into the (system’s) fan assembly.. Grease travels through the length of the system, reacting with all the particulates in the exhaust, and becomes a match head sitting on a striker. Such was the case in Boston on August 29, when firefighters Warren J Payne and Paul J Cahill died “in an inferno after a kitchen grease fire exploded into a 2000- degree fireball” inside Tai Ho Mandarin and Cantonese Restaurant, as reported by the Boston Globe. By the Globe’s account, Cahill was killed when a “massive plume of carbon monoxide enveloped his as he fought the fire inside the restaurant’s kitchen.” Payne was “killed by a massive fireball created when pent-up flammable gases found an ignition source and detonated, engulfing him in flames that incinerated him in seconds.” The fire, according to the union’s report “had ignited and burned for an extended period of time prior to the fire companies being dispatched and arriving on scene. This extended burn time allowed the fire to ‘feed’ and increase in size within the restaurant’s exhaust hood and ducts and ceiling areas directly in and over the cooking area …. Accumulations of grease along with the ceiling support framing and roof structure were ignited. The union’s report noted “considerable grease build-up and a separation in the ductwork that was made obvious by the observance of rust and severe degradation of the duct-to-hood connection in the plentum chamber. This separation in the duct was approximately 12 (inches) long and 1(inch) wide”. After the grease caught fire and smoldered, a sudden release of gas from a broken feed and created space within the ceiling, caused by a sudden drop of the HVAC unit thanks to the weakened “structural members, ” lead to the explosion. But after assessing data on various hood types and their in-restaurant operations compared to product guidelines based on standards set by the American Conference of Industrial Hygienists and the American Society of Heating, Ventilating and Air-Conditioning Engineers, the research team’s conclusions did not express optimism. “Restaurant operators need to be more diligent about the operation of their kitchen ventilation units. .. Restaurants should be sure that contractors installing or working on ventilation systems are familiar with the published guidelines. (Units) should be periodically reevaluated to detect any change in performance. Besal wrote,”The first line of defense in prevention of deadly kitchen – exhaust fires is hiring a properly trained, qualified and certified cleaning contractor’as required by NFPA-96 (the National Fire Protection Association’s Standard for Ventilation Control and Fire Protection). Secondly, ” qualitative routine compliance inspectors that are normally provided by a local authority,” can ensure proper exhaust operation. But prevention goes beyond cleaning and inspection.”From the standpoint of serviceability, maintenance for kitchen exhaust systems begins with proper design and installation. The onus on the design architect and the mechanical engineer should be to eliminate any possible excuse for exhaust cleaning contractors to not clean any portions of exhaust systems,” Besal noted. Because “even legitimate cleaners (frequently) cannot properly clean and service the entire system” due to design, Shaw noted that a regular, proper maintenance regimen is key to the integrity of an exhaust system. He also suggested hiring exhaust cleaners who adhere to standards like NFPA-96 “as well as similar standards from the International Mechanical Codes,” as do IKECA members. Besal agreed. ‘Building codes must be taken as a united whole inclusive of construction and maintenance,” he noted, “Proper exhaust system cleaning must be a continuous program to operate with the level of safety intended by model codes.” “The company that cleaned the exhaust system in Boston did not follow any of those codes,” Shaw said, noting that the company in question is not and IKECA member. The consequences of not using trained and certified KEC technicians can be devastating. According to the U.S. Fire Administration, nearly 6,000 restaurant fires are reported each year in the United States. And, of those, a percentage, around 21%, depending on the year, are caused by a failure to clean. And when you compare those figures to the shear number of restaurants operating in the country, it may not seem very high. But the concern is not the 6,000 establishments that will experience a fire in the next 12 to 15 months, it is one restaurant: yours. It can be mesmerizing to sit before an open kitchen and watch a talented chef stoke the flames of whatever dish is on the menu. However, those flames dance dangerously close to some very flammable material, and the OSHA-required automatic fire suppression system cannot be relied upon to immediately extinguish any fire. They can fail due to a grease clog, or the nozzles may be positioned incorrectly. Often an exhaust system fire spreads into unreachable areas of the ductwork. And if those areas have not been properly cleaned and maintained, the results can be catastrophic. The bare metal of the kitchen exhaust system is designed to contain and cool any hostile or escaping fire, says Oliver Moore, Deputy Utah State Fire Marshal. He explains that fuel is introduced in increments each time cooking takes place: grease-laden vapors or residual cooking oil, effluent toxins, and soot. This mixture is carried up and away from the cooking surface and naturally adheres to collection filters and the cool sides of the ductwork, up to the fan housing and blades with the residual blown into the air. Within the ductwork, the buildup of grease or creosote creates a type of biodiesel or flammable fuel. When safety procedures are not addressed, such as regular exhaust system cleaning and service, normal cooking operation will, in time, set a fire on the residual grease buildup, he adds. Once a hostile fire is within the ductwork, temperatures of 1,200 to 1,500 degrees may be reached, which may be hot enough to extend into the building structure. Recent National Fire Protection Association (NFPA) statistics (2006–2010) indicate $246 million in property damage annually. There is an average of two deaths per year in restaurant fires and 115 injuries — neither of these numbers includes the risk to firefighters. Experts — mechanical engineers, electrical engineers, fire protection engineers, metallurgists — are retained on all fronts. “A complex restaurant fire investigation may last 3 to 5 years from the date of the fire to the date of the final settlement or adjudication,” says Richard Martin of Martin Thermal Engineering, a fire investigator and frequent expert witness. 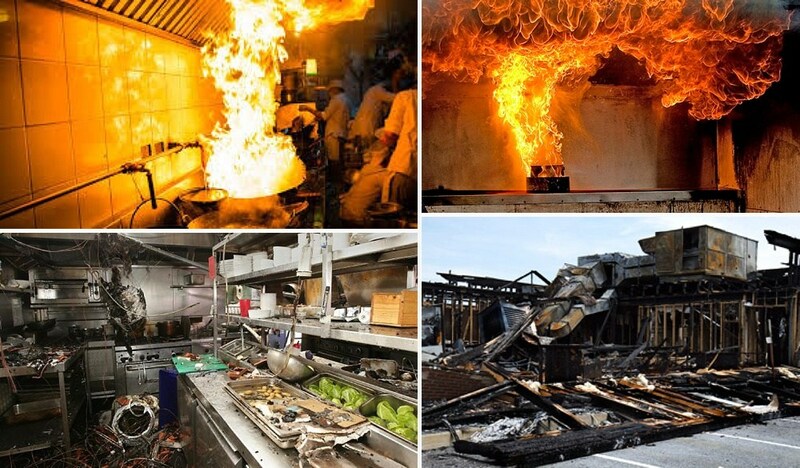 According to Moore, 53% of all restaurant fires are kitchen exhaust system fires. It’s easy to look at that big hood and hear that fan and think that everything dangerous is being blown straight up and away, but that simply is not the case. The kitchen exhaust system comprises the hood, filters, plenum, fans and what may be a labyrinth of horizontal and vertical ductwork, and the parts that you can see are likely only a small portion of the whole. Getting the cleaning job done correctly starts with the bid process. It’s not about who will do it for the least amount of money. “Hiring a certified cleaning contractor who is familiar with the applicable standards is nearly always safer than using an uncertified cleaner who charges a lower fee,” says Martin. Matt Mongiello of Interior Maintenance Company, Inc., a kitchen exhaust cleaning company located in Pennsylvania, says restaurant owners and managers should look for a contractor that specifically states they will perform a complete cleaning of the entire kitchen exhaust system, mentioning all associated components. A contractor who only talks about the hood and filters is throwing up a red flag and can seriously hurt your business in the long run. It is also important to confirm that the contractor has proper insurance and qualifications to perform the work, he adds. Proper documentation of the job is key. This should include identifiable before-and-after photographs of the work completed. As Moore mentioned, a sticker is attached to the hood showing the name of the service company, the name of the person performing the work, and the date of inspection or cleaning. You should also expect a written report that details the work completed and specifies any areas that were inaccessible or not cleaned and why. As a restaurant owner, it is imperative that you get to know the twists and turns of your system, and there are two ways to do so. One is to hire a reputable, kitchen exhaust cleaning company with certified staff members, who will not only thoroughly clean it, but will provide you with photographic evidence of the work done in each corner and each component. The alternative is to see each piece of ductwork, blackened and deformed from the fire, laid out in succession in your parking lot as the investigators do their work. — Randall Rauth is the International Kitchen Exhaust Cleaning Association’s president and the owner of Hood Cleaning Inc.
Rauth started his career in the restaurant service business. To find a qualified commercial kitchen exhaust contractor, visit the ‘Find A Member’ section of the IKECA website, www.ikeca.org. Email information@ikeca.org. Check grease- arresting filters for excessive grease accumulation. Check hood and its exhaust plenum for excessive grease accumulation. Check grease and gutters for excessive grease accumulation’. Check the grease-arresting filters are secured in the correct position and undamaged. Note: Owing to wide variations in usage, frequency of cleaning is subject to the assessment of the inspector or the requirements of the regulatory authority. In some cases, cleaning may need to be more frequently than monthly. Check for excessive leaks or damage to grease- arresting filters, and replace as necessary. Note: Non-metallic grease filters and other special types have to be replaced at specific time intervals whether damaged or not. In these cases, follow manufacturer’s instructions. WHY CAN CLEANING YOUR FILTERS IN-HOUSE BE A PROBLEM? Kitchen hood cleaning for staff can be risky with injuries that occur while cleaning kitchen exhaust filters and equipment can be damaged when used to stand on to reach the grease filter hoods. Should you install kitchen grease filters incorrectly it can lead to duct-work contamination, which can result in a higher risk of fire and/or repair & maintenance issues. Kitchen exhaust cleaning with hot water and chemicals can create an unsafe work environment for your staff and used without correct procedures, can even result in injury and damage to equipment. If the staff are not trained with the correct procedures, you risk the potential for your insurance claims to be denied. Kitchen grease filters from Shepherd Filters will be at your best defence against a restaurant exhaust inspection infringements or fines. Insurance claims are commonly rejected if grease hood filters, canopies or the exhaust system have not been properly cleaned and maintained. Avoid this by installing disposable kitchen grease filters or contact us directly for more information.